Cake Shoving and All That | When Do They Serve The Wine? Everything and anything will be videotaped, discussed, analyzed, and scrutinized on Friday at the Royal Wedding. Lucky for us peons, we have some choices as to what to record of our wedding day. On mine, we didn’t videotape anything, but a boxful of photos were taken. The only two things that went wrong on our happy day were not recorded: the rice was gummy, and the saxophone player got sick and ended up in our bed (not with us, mind you). So no one made a fool of themselves– not that I know of. But we still have wonderful memories. 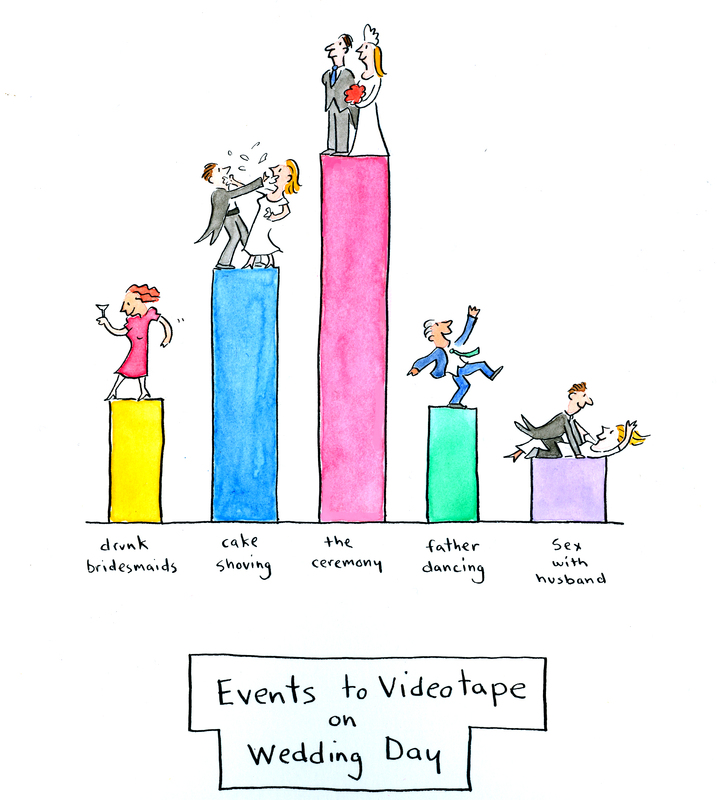 This entry was posted in From the Book and tagged Cartoon, ceremony, Royal Wedding, video, weddings. Bookmark the permalink. We banned video at our wedding but my uncle got a bootleg. I’m secretly grateful. What I didn’t want were obnoxious microphones and lights and all that jazz. Nothing produced. What we have, thanks to renegade uncle don, is a great candid recording of a great night. That’s great. We felt the same way. No cameras at the actual wedding. But yes at the party!